Beautifully engraved Certificate from the Peregrine, Inc . This historic document was printed by the United States Banknote Company and has an ornate border around it with a vignette of the company's name and logo. This item has the printed signatures of the company's officers including Steve Gardner as Chairman and CEO. The stock price hit a high of $80 in March 2000. 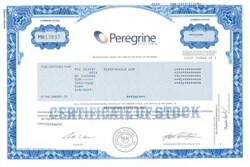 The Nasdaq stock market delisted software maker Peregrine Systems Inc. at the opening of business on July 5, 2002. Peregrine, reeling from an accounting scandal, a management reshuffle and weak demand for its products, said it is out of compliance with Nasdaq rules since its accountants at Andersen informed the company that its financial statements for 2000, 2001 and 2002 should not be relied on. Peregrine said restating its results for those years put it out of compliance with Nasdaq rules requiring that all U.S. Securities and Exchange Commission reports be filed with Nasdaq on a timely basis. SAN DIEGO, May 6, 2002 -- Peregrine Systems, Inc. (NASDAQ: PRGN) announced today that the board of directors has authorized the audit committee of the board to conduct an internal investigation into potential accounting inaccuracies brought to the attention of the audit committee by KPMG, the company�s independent auditors. KPMG was engaged by Peregrine in April to replace Arthur Andersen LLP for the audit of the company�s recently completed fiscal year. The scope and magnitude of these matters have not been determined. Based on the preliminary information reviewed to date, certain transactions involving revenue recognition irregularities, totalling as much as $100 million, have been called into question and may have been recorded during periods in fiscal 2001 and 2002. These transactions were recorded initially as revenue from the company�s indirect channels and may have been written off in later quarters. These channel transactions and other accounting matters to be investigated may impact financial results for periods in fiscal 2002 and prior. Peregrine has informed the staff of the SEC of its audit committee�s internal investigation and will keep the SEC informed of its progress. Additionally, the board announced the resignations of Steve Gardner, chairman of the board and chief executive officer, and Matt Gless, chief financial officer, executive vice president of finance and also a director on the board. In connection with these resignations, the board of directors has appointed Rick Nelson as acting chief executive officer and a director of the board from his position as Peregrine�s executive vice president. Peregrine also named Fred Gerson as interim chief financial officer, and Charles La Bella as executive vice president and senior counsel. Mr. Gerson currently serves as the chief financial officer of the San Diego Padres and has held the chief financial officer position with a number of public and private technology companies, including Marimba, Maxis, and Peter Norton Computing. Mr. La Bella was formerly the U.S. Attorney for the Southern District of California and most recently a partner in the San Diego office of McKenna & Cuneo. In addition, Peregrine�s board has named John Moores as its new chairman. Mr. Moores has been a member of Peregrine�s board since 1989 and previously served as chairman from March 1990 through July 2000. The board also authorized the appointment of an executive committee, consisting of directors Rod Dammeyer, John Moores, and Charles Noell, to oversee and assist in this management transition. Peregrine will host a conference call on May 6, 2002 at 8:30 a.m. EDT, 5:30 a.m. PDT. Participants should call (888) 343-1303 within the United States or (212) 271-4781 from international locations. Attendees should dial in at least 15 minutes prior to the conference call. Beginning approximately one hour after the end of the call and continuing through Wednesday, May 8, 2002, a playback will be available by calling (800) 633-8284 within the United States or (858) 812-6440 internationally. Callers to the playback should use reservation number 20586670. About Peregrine Founded in 1981, Peregrine provides Infrastructure Management solutions, which enable companies to achieve a state of frictionless business. Its solutions reduce costs, improve profitability and release capital, generating a lasting and measurable impact on the productivity of assets and people. Peregrine�s software manages the entire lifecycle of an organization's assets, from IT equipment and fleets of vehicles to telecom and facility assets. In addition, its Employee Self Service solutions empower employees with anytime/anywhere access to these enterprise resources, services and knowledge � resulting in improved productivity and asset utilization. Peregrine also provides integration and adapter technology to allow its Infrastructure Management solutions to interoperate with other enterprise applications both inside organizations and between organizations. Headquartered in San Diego, California, Peregrine�s customers include 92 percent of the Fortune 500 companies. For more information, visit Peregrine's Web site at www.peregrine.com. Please note that if you buy a modern certificate from a discount or full service broker, it can cost you between $55 to $100 and that doesn't even include the cost of the stock. You will be charged for a commission and certificate issuance fee. Furthermore, if the company has been delisted and no longer traded, you will unable to get the certificate. Also, the modern certificates we offer have not been folded in thirds which is usually done if you order them directly from a broker. Lastly, the certificates are not issued in your name so if you frame the certificate and/or subsequently resell it as a collectible, the certificate won't have your personal information printed on its face. We do not require you to pay an additional charge and buy a frame from us for your certificate. We want our customers to be satisfied and pricing along with quality customer service is an important part of our customer satisfication.